Hire A Professional & Not Your Friend! Happy Friday! I hope you're looking forward to the weekend as much as I am. Although we're just getting over the Thanksgiving break, I'm ready for another one. At the request of one of my brides, I'm writing this post. This is something that many of us in the wedding industry talk about quite frequently, why you shouldn't hire your family or friends to be your wedding planner or vendors at your wedding. In theory, it sounds good, but in actuality, it only works out in rare instances. Today, I'm listing my top 10 reasons why you should really refrain from doing so and stick with the professionals. 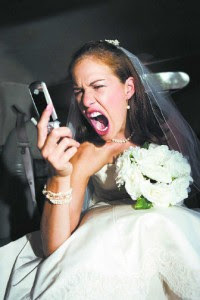 It may keep you from being a stressed out bride on your wedding day. Direction: A professional offers direction and helps guides you through the planning process. Even though the wedding planning books can give you and outline of what to do and when, a professional wedding planner is there to offer continued guidance and ensures that you're staying on target with securing your vendors in time for your wedding. Your friend may not be so cognizant of benchmarks to keep you on task for your wedding to give you the gentle push you need in the right direction. Vision: A professional helps articulates your vision to other professionals. One of the things that I do, and most of the wedding planners that I know is to create an inspiration board for my clients, after the consultation. When communicating with other vendors, it makes it much easier to present a photo. A professional is able to listen to the bride (or groom) and create a concept, vision, or direction for other professionals to follow. A friend may not know how to fuse your style with his to create one cohesive vision for your wedding or special event. Budget: A professional manages your budget and helps you stay on target with your budget while maintaining the vision that you've originally set. If there is something that you'd like to have, the professional planner knows the budget and whether or not you can afford it. If your budget is low, a professional can offer creative suggestions to still maintain the original vision, whereas your friend may not.. Knowledge: In this business, trends are constantly changing. The professionals that I know and work with are masters of their craft; certified wedding & event planner, certified photographers, and certified florists, and so on. We are always attending conferences and seminars to continue our knowledge of what's going on in the industry so we're always fresh. Your friend may not have the knowledge, the certifications, and my just look at planning as a hobby. Listening: Many brides have been thinking of their wedding day since they were little girls. As a professional, we're able to actively listen to what our clients want and offer suggestions based on what they want and what they can afford. Your friend may not be fully listening and may be more interested in offering ideas and suggestions. Accountability: As a professional, we' often hear, "My cousin can do this" or "I know someone who can". It's difficult for us to get a bride to understand that friends and family members typically want to enjoy the day and aren't looking to work, like a professional would. Professionals show up to work and get the job done that they were hired to do. They aren't looking to join the party or have a good time. Quality: Professionals are not only want to give you the wedding/event you've envisioned but are also concerned about their name and reputation. They want to produce a quality product that you and they would be happy with. Your friend may be more concerned with producing a product that you can afford, without offering any options or creative alternatives for what you can afford, often leaving you disappointed; after the fact. as the old adage goes "you get what you pay for"
Mediation: As a wedding professional, we are often having to play a mediator between the mother and the bride, or other family members. If you're a friend or family member, you may be too close to the parties involved to provide mediation. It's often a great idea to have an outside party. Vendor Relationships: As a professional, you have the opportunity to build relationships with vendors in all aspects of the industry. With these relationships often comes added benefits that are passed on to your wedding. Your friend wouldn't have this. Venue Spacing: As a professional, we aren't always there when the venue is chosen, but we know how to come in and make the space work for what your vision is. If we're fortunate enough to be there before the venue is selected, we're able to help you choose the one that most fits your vision, budget, and works well logistically. Your friend may not be thinking of these things and thinking of the venue that looks that best.